Benign fibroushistiocytoma is a benign connective tissue tumor rarely seen affecting the head and neck region. These tumors were believed to be of histiocytic origin as they are comprised of cells, which showed spindled morphology and cells with a round histiocytic appearance. The current concept consents that the lesional cells rather represent a fibroblastic differentiation. Diagnosis of these tumors proves to be challenging even with the use of immunohistochemistry due to lack of any specific markers. Here, we describe a case which presented in the gingiva mimicking a reactive lesion, which in fact was a tumor. The most common sites affected by benign fibrous histiocytoma are the soft-tissues of the lower extremities, less frequently in the upper extremities, retroperitoneum and orbit. 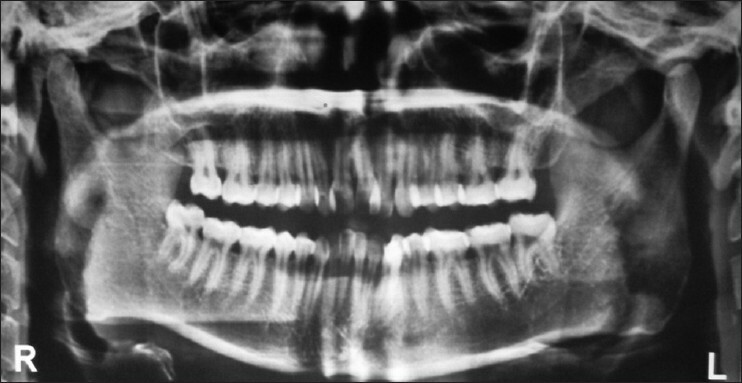 A 23-year-old male patient reported with a chief complaint of a growth on the gums of the lower front teeth region for past 1 month. The growth was small when he noticed it and gradually increased in size. Clinical examination revealed two small growths, on both the buccal and lingual aspect of the interdental papillae of 32 and 33. The surface of these growths appeared reddish pink in color measuring around 1 cm × 1 cm in size. On palpation, the growth was firm in consistency and non-tender [Figure 1] and [Figure 2]. An excisional biopsy was carried out and both the buccal and lingual growth were submitted separately for histopathological investigations. The section made from the buccal growth showed a connective tissue mass devoid of epithelium. The connective tissue showed budding capillaries toward the center with dense infiltrate of chronic inflammatory cells. The periphery of the mass appeared to be covered by a pseudomembranous layer. The lingual growth showed a highly cellular connective tissue mass covered by a proliferating epithelium. The lesional cells were plump spindle shaped cells, which in certain areas showed the crisscross pattern or storiform arrangement. The connective tissue had also shown numerous round histiocytic cells and blood vessels. The sections were sent for immunohistochemistry to detect the expression of Vimentin, smooth muscle actin (SMA), desmin, S-100 protein and CD34. The sections showed strong positivity for vimentin and negative expression for vascular, muscular or neural markers [Figure 3]. Based on the histopathological features and immunohistochemistry findings, a diagnosis of benign fibroushistiocytoma was given. The diagnosis of benign fibrous histiocytoma can prove to be challenging in light microscopy even with the use of immunohistochemistry as these tumors lack any specific markers and are primarily diagnosed based on the absence of marker expression. 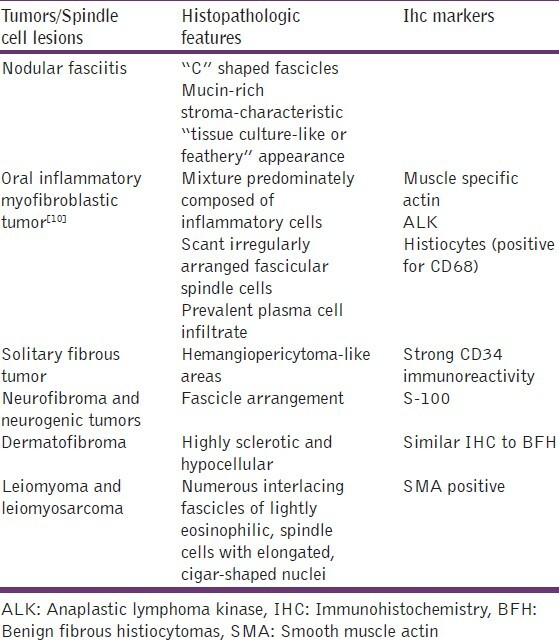 Histologically, these tumors show lesional tissue comprising of highly cellular connective tissue comprising of spindle cells. Thus, tumors showing similar histological appearance have to be considered in the differential diagnosis and ruled out by immunohistochemistry for other spindle cell lesions. The panel of markers most commonly employed for spindle cell lesions are SMA, vimentin, S-100 protein, Desmin, cytokeratin, HMB 45, CD34, CD31. Review of literature show that benign fibroushistiocytoma exhibit strong immunoreactivity for vimentin, focal expression of CD68 while no expression for other markers as was observed in the present case. The histopathology of these tumors shows a submucosal mass, consisting of fibroblasts and histiocytes in rotating or fasciculated bundles, inflammatory cells, multinucleated giant cells and foam cells. The hallmark of these tumors is the characteristic "storiform" or "cartwheel" arrangement of the lesional cells. In the present case, two sections were prepared, one from the nodular mass seen on the interdental papillae of 32 and 33 on the buccal aspect and the other section from the lingual aspect. The section from the buccal aspect showed the histologic appearance of pyogenic granuloma while the lingual mass showed a benign fibrohistiocytic tumor mass with overlying proliferating epithelium. A similar case on the tongue was reported by Syed et al. where primary biopsy report of pyogenic granuloma was given. On recurrence, a deeper biopsy was carried out, which showed fibrohistiocytic appearance confirmed with immunohistochemistry, which showed strong positive expression for vimentin and CD68. The current choice of treatment for benign fibrous histiocytoma of the head and neck as well other parts of the body is complete resection and recurrence rate is found to be nil. ,, In conclusion, the tumors occur very rarely in the oral cavity and should be considered in the differential diagnosis. 1. Kumar V, Abbas AK, Fausto N, Aster JC. Robbins and Cotran pathologic basis of disease. 7 th ed. Pennsylvania: Elsevier Saunders; 2005. p. 1252-3. 2. Baradaranfar MH, Moghimi M. A case report of benign fibrous histiocytoma of paranasal sinuses and role of transnasal endoscopy in its treatment. Acta Medica Iranica 2005;43:230-2. 3. Rashid A, Goh BS, Ghani A, Saim L. Benign fibrous histiocytoma of the external auditory canal: Case report and literature review. Banglad J Otorhinolaryngol 2012;18:77-80. 4. Katagiri W, Nakazawa M, Kishino M. Benign fibrous histiocytoma in the condylar process of the mandible: Case report. Br J Oral Maxillofac Surg 2008;46:e1-2. 5. Gnepp DR. Diagnostic surgical pathology of head and neck. 2 nd ed. Philadelphia: Saunders Elsevier; 2009. p. 200. 6. Syed A, Hasan SH, Hosein MM. Oral fibro-histiocytic lesions: Immuno-histological investigation and review of an unusual presentation in the tongue. Pak Oral Dent J 2008;28:217-22. 7. Regezi JA, Scuibba JJ, Jordan RC. Oral pathology, clinical and pathological corelations. 4 th ed. Missouri: Saunders Elsevier; 2003. p. 168. 8. Ajura AJ, Sumairi I, Lau SH. The use of immunohistochemistry in an oral pathology laboratory. Malays J Pathol 2007;29:101-5. 9. Mills SE, Carter D, Greenson JK, Reuter VE, Stoler MH. Sternberg's diagnostic surgical pathology. 4 th ed. Philadelphia: Lippincott, Williams and Wilkins; 2004. p. 168. 10. Binmadi NO, Packman H, Papadimitriou JC, Scheper M. Oral inflammatory myofibroblastic tumor: Case report and review of literature. Open Dent J 2011;5:66-70. 11. Nakamizo M, Yokoshima K, Sugisaki Y. Malignant fibrous histiocytoma of the hypopharynx: A case report in a young adult. J Nippon Med Sch 2004;71:301-5.